Although careful donor selection reduces tissue contamination, close microbiological control of harvested allografts remains a key task of tissue banks. To guarantee the safety of human tissues for allograft transplantation, a decontamination regimen must be adopted which, as recommended by European guidelines, is active against the majority of microorganisms isolated in tissues. Antibiotic decontamination methods differ from one tissue bank to another in terms of antimicrobial agents, temperature and length of exposure. 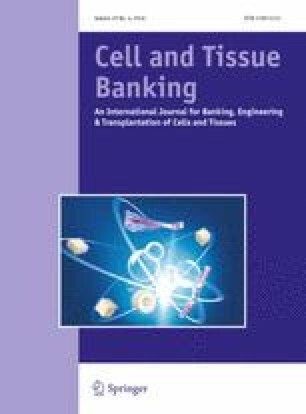 After identifying the most effective antibiotics against the bacterial strains most commonly isolated in allografts, Treviso Tissue Bank Foundation demonstrated the efficacy of an antibiotic cocktail for tissue decontamination containing Gentamicin, Vancomycin and Meropenem. The aim of this study was to analyse the degradation kinetics of the three antibiotics according to preparation method and use. The results show that only Meropenem is unstable at + 4 °C, while Gentamicin and Vancomycin are valid for over 10 days. We thus established to add Meropenem before the start of the tissue decontamination phase. We would like to show our warm thank to Dr. Trojan Giovanni who supported us in data evaluation.